For almost 20 years we have seen very low levels of new planting of trees in NZ, and in the last 10 years we have witnessed net deforestation of 100,000 ha, primarily to make way for more dairy cows. 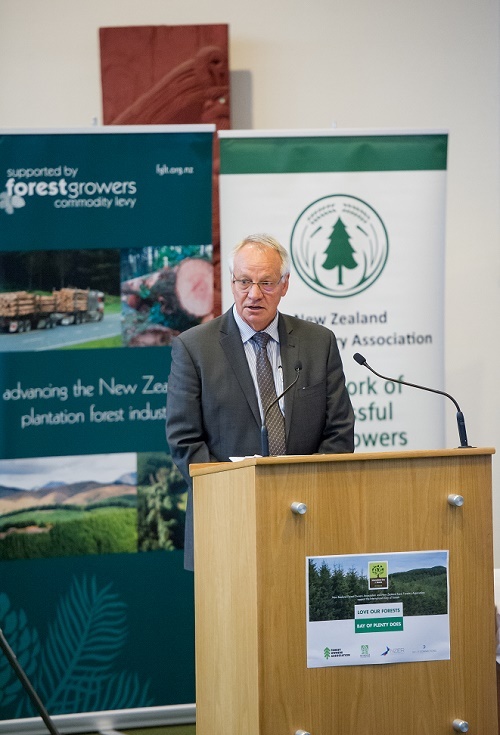 The forestry sector is a major export earner and employer in NZ, but within the sector we have been frustrated by the lack of understanding of the contribution it makes to our GDP and to our environment, especially soil and water protection and also to biodiversity and recreational use. NZ Forest Owners’ Association and NZ Farm Forestry Association commissioned NZIER to get baseline data into a readable format to help with that understanding. Funding was sourced from the Forest Growers’ Levy Trust. The NZIER report was released in Rotorua on 21st March with follow-up events in Gisborne and Whangarei. It has received good local and national media coverage including this in the NZ Farmer: Forestry would compete if farming paid for its pollution. The report suggests that non-monetary benefits are very material for NZ’s economy and society. They could well exceed financial outputs from commercial forests. The full report can be accessed on the NZFOA web site: NZIER - Plantation Forestry Statistics. One key conclusion from the study was that non-financial outputs of the sector are very material, but poorly measured and reported. The authors suggest a satellite account for forestry is needed, similar to that run in the government’s GDP accounting for tourism. New Zealand is facing environmental degradation, especially fresh water quality. That cannot be helpful for our safe food export branding, nor for our largest export earner, tourism. The same morning that the NZIER report was released a media story came out about the contents of a Vivid Economics report on options to get New Zealand to carbon neutrality, and when it might be achieved. Vivid says New Zealand agriculture needs to reduce its stock numbers on one hand and increase its forest cover on the other. The report comes from an independent source and I have every confidence in their reasoning. I’m not sure how well Vivid’s predictions of technological solutions to reduce greenhouse gas emissions are going to work. I note that the report last October from the Parliamentary Commissioner for the Environment, was sceptical of methane inoculations for instance. Dr Wright’s solution in that report was clear. And the Vivid report has come up with the same solution. We need more trees. An increase in plantation forestry is the best and most immediate answer to reducing New Zealand’s greenhouse gas emissions. While our tree growing industry, represented by the Forest Owners’ Association and Farm Forestry Association, can play a support role, they cannot themselves plant trees as they do not have access to much land that is not already forested. Farmers, Maori Incorporations and government departments that have access to non-forested land must be convinced. That will require some policy changes around land use. As an example the Bay of Plenty Regional Council notified Plan Change 10 locks in Nitrogen Discharge Allowances for forestry at levels much lower than for pastoral land. This sort of policy simply rewards existing polluters and has the perverse effect of telling investors not to convert pastoral land to forestry as your environmental contribution will simply be socialised to protect other land users. Landowners will need support to achieve growth in plantation trees on a scale that the Vivid report suggests, which is between 1.0 and 1.6 million hectares by 2050. 1.6 million ha would nearly double the size of New Zealand’s plantation forests in a little over 30 years from now. With cross-party support for the Vivid proposals as a sign of parliamentary endorsement, I anticipate we will need to gear up for large planting increases very soon. I would warn that the nursery industry will need time to expand to meet the targets. Seed supplies are available but nurseries will need to gear up. Access to labour will be the biggest constraint. We really do need a Recognised Seasonal Employer scheme specifically designed for forestry silviculture workers. That’s one of the ways in which we need government assistance. A Ministry or at least a dedicated Department within MPI focused on forestry would also be welcomed. Clearly much if not most of the desired increase in plantings will be on farmland. Trees offer a comparable return to farming sheep and cattle. Timber harvesting offers a diversification of income with the advantage that timing of harvest is flexible, providing financial resilience when other farm products may be in a down cycle. It is a risk spreading economic option wiser farmers have taken up for years. The huge level of greenhouse gases produced by our livestock industry is the other side of the equation. Our pastoral industry must be congratulated for its increasing carbon efficiency over more than two decades. Nonetheless, it is clear that the rush to convert to dairy cows in this same period has had unacceptable environmental consequences – both for greenhouse gas emissions and water quality. Trees have been replaced by dairy cows which have compromised the water quality. New Zealand cannot support the numbers of dairy cows it has with the technology available. The central North Island is a case in point. The Waikato and other catchments cannot take the pressure. This same region is our major timber source. As indicated in the NZIER report, together with processing it is worth more than $600 million to the Bay of Plenty economy. Yet we are unable to give confidence to the processing industry to develop in this or any other region in New Zealand without providing certainty of supply of the raw material. We all need a modern and sophisticated timber processing industry. We’ve had a wake-up call with the Kaikoura quake, that steel and concrete have their limitations – even with the best building codes. The new Kaikoura District Council building was to be handed over to the Council the very day the quake struck. It is three stories of laminated timber produced in New Zealand. The building was undamaged and used by the emergency services as their headquarters. Many Western countries have promoted the use of engineered timber in commercial and multi-storey residential structures. NZ remains a laggard in that regard, with the Christchurch rebuild being the most obvious missed opportunity. Timber is light, it locks up carbon and is easy and quick to assemble using the latest technology. Timber can also be built a number of storeys high without compromising its safety. The Rotorua Lakes Council should be congratulated for promoting timber structures. They get it! Put that together with the obviously substantial, but not yet accurately quantified value of trees in enhancing water quality, biodiversity, land stability and recreation, then we have every reason to be positive about our future.